I'm a firm believer that when you're having company you cook what you know. For example, if you're coming over to my house for dinner as a guest you'll likely get some Italian food. It's what I know, it's what I do best, and it's what I feel safe preparing. Conversely, you'll probably not get steak/beef/pork/etc. However, on the 4th of July I made ribs for the first time and had company... so what went wrong here?! Well, I am now the luckiest girl in the world because my sister and her boyfriend just bought a house 6 minutes away, so at the last minute they decided to come by for dinner as well as my mom. I warned everyone that I had never made this before and I could make no promises to the outcome, but I think we were all beyond pleased. I'll never make ribs any other way. I loved the way the meat literally fell off the bones. When I was lifting them out of the crockpot I noticed a few bones actually fell back into the pot, leaving just the perfectly seasoned meat behind. The BBQ sauce was amazing. I loved the flavors and think that really added a whole new level of flavor here. You can use just plain bottled BBQ sauce if that's what you prefer but it took literally 2 minutes to make this "homemade" sauce and it was delicious. Try this! Try this soon. I know we'll be having this recipe again soon. 1- Preheat oven to 400 degrees. 2-Place ribs in a shallow baking dish and season with salt, pepper, garlic powder, and onion powder. 3- Bake for 15 minutes and then turn over and bake for 15 more minutes. Drain fat. 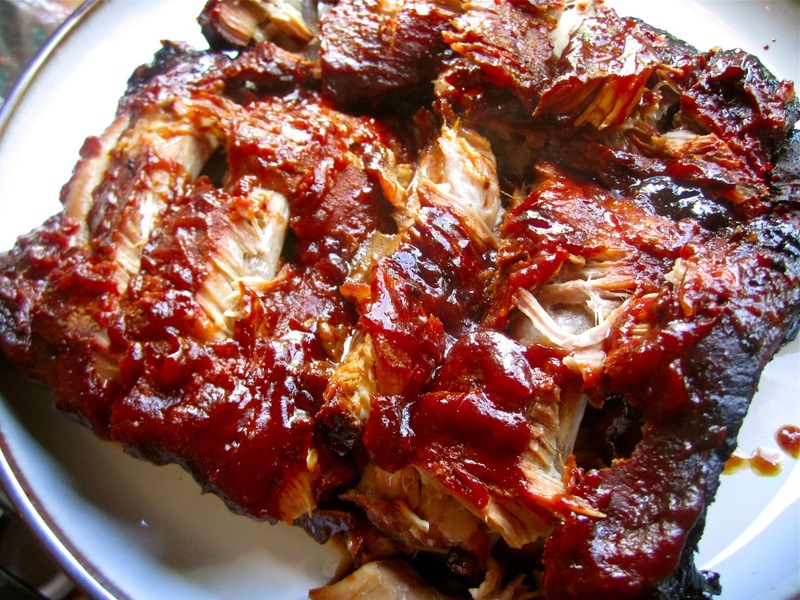 4- In a medium bowl combine BBQ sauce, ketchup, brown sugar, vinegar, Worcestershire, and oregano. 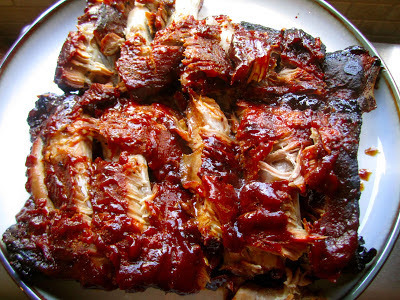 5- Place ribs in a large slow cooker (at least 6 quart). Curl them or cut them in half. Pour sauce on top and cook on low for 6-8 hours or until tender. 6- If you want to carmelize your bbq sauce put them back in the oven for 15 minutes at 400 degrees. When I saw this recipe I was so excited because I hadn't fixed ribs in a while nor had I used my slow cooker in a while. I got the chance to make this yesterday and it was oh so good! I did put them in the oven afterwards to "carmelize the bbq sauce" and I loved the way the ribs looked afterwards. They were lip-smacking-finger-licking-good. Thank you so much for this recipe! This is my new ribs go-to recipe.